485 Women in Aviation International - Airplane Geeks Podcast - The weekly audio podcast that explores and expands your passion for aviation. Our guest is the president and founder of Women in Aviation International. In the news, we discuss the departure of the FAA Administrator, the Air Force tanker program, fighter jet intelligence gathering in Syria, woes at New York’s JFK International Airport, and remembering astronaut John Young. Women in Aviation Conference March 2016 reaching $10 million in scholarship awards in 20 years. Dr. Peggy Chabrian is president and founder of Women in Aviation International, which represents more than 13,000 women and men from all segments of the aviation industry including general, corporate, commercial, and military aviation. Dr. Peggy Chabrian, Women in Aviation International. Peggy tells us about current WAI objectives to promote women in aviation and the progress that has been made. We look at the current legislative action, such as the Promoting Women in the Aviation Workforce Act of 2017 in the House (H.R. 4673) and Senate (S.2244) and note the Women in Aerospace Education Act (H.R. 4254). 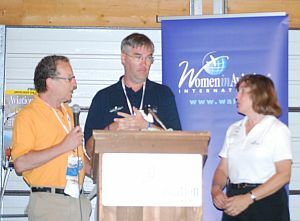 Peggy talks about the active Women in Aviation International chapters, the scholarships available, and the annual conferences. 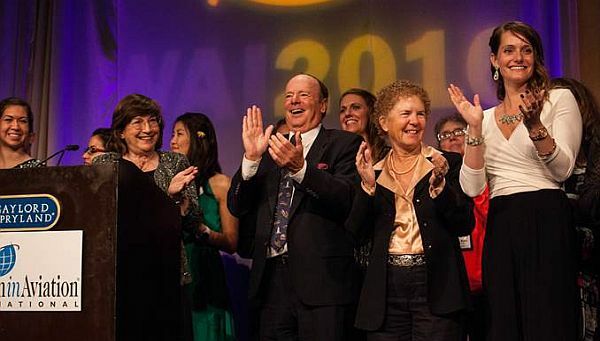 The 29th Annual International WAI Conference will be held March 22-24, 2018 in Reno, Nevada, and will include an award ceremony for inductees into the WAI Pioneer Hall of Fame. We note that Women in Aviation International is not for women only and that the membership includes men and women of all ages. 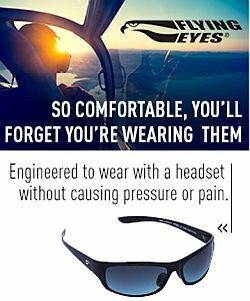 Peggy is a long-time aviation enthusiast and professional aviation educator, a 2,200-hour commercial/instrument multi-engine pilot and flight instructor flying for over 30 years. Most recently she added helicopter and seaplane ratings to her flight qualifications. Rob and David present WAI with a donation on behalf of the Airplane Geeks listeners in 2011. Vice President of Parks College; Dean of Academic Support for Embry-Riddle Aeronautical University’s Prescott, Arizona campus; Director of the Center of Excellence for the Aviation/Space Education at ERAU’s Daytona Beach, Florida campus; and, Chair of the aviation department at Georgia State University in Atlanta, Georgia. Peggy was the second woman to ever hold the position of dean of an engineering school in the United States. She serves on several boards and is the past president and board member of the University Aviation Association. Peggy also served on the board of the Experimental Aircraft Association for 16 years. 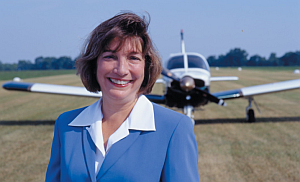 She is the publisher of Aviation for Women magazine, an international speaker, and an author. Women in Aviation conference exhibition hall. Michael Huerta’s term as FAA Administrator has ended. The White House has offered no nominee to replace Huerta, who previously said he had no intention of staying on. The current FAA deputy administrator, Daniel Elwell, will become the acting head. Elwell was appointed as FAA’s deputy administrator in June. He is a graduate of the U.S. Air Force Academy and a former Air Force and airline pilot. The Boeing KC-46A Pegasus tanker is designed to replace the old KC-135, but several issues have dogged the program. The tanker’s boom can scrape the aircraft being serviced, and there may be difficulties with the camera system used by the boom operator. An issue with the KC-46’s high-frequency radio still concern’s the Air Force. Russia and the U.S. have top line fighters operating in Syria, which gives both countries an opportunity to observe the other’s aircraft and collect data. A broken water pipe feeding the sprinkler system at JFK International Airport Terminal 4 flooded a baggage claim area. Power was cut and part of the terminal had to be evacuated, stranding travelers without their luggage. Why Did New York’s JFK Airport Struggle to Cope With Its Flight Backlog After the Bomb Cyclone? The terminal flooding was preceded by a snowstorm that was worse than expected. The airport was closed and airlines scheduled flights based on the projected time to reopen. But that time was pushed out, causing diversions and turnbacks of many international flights. When flights to JFK resumed, airport capacity was exceeded. Astronaut John Young, who walked on the Moon during Apollo 16 and commanded the first space shuttle mission, passed away at the age of 87. He is the only person to go into space as part of the Gemini, Apollo, and space shuttle programs and was the first to fly into space six times – or seven times when counting his liftoff from the Moon during Apollo 16. David brings us Part 1 of the EC-121 Warning Star. This entry was posted in Episodes and tagged Air Force, FAA, JFK, KC-46, NASA, Russia, women in aviation on January 10, 2018 by maxflight.